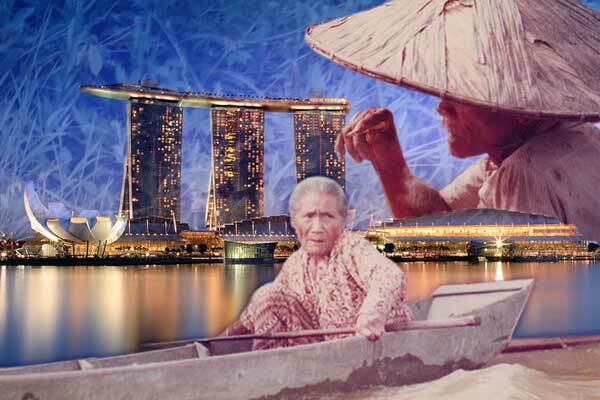 You are at:Home»Columns»How I See it»Bakun Dam, or Singapore? It’s just easier to be lost in wonder, love and praise. That was almost 20 years ago. I was in a Kenyah longhouse in the rural interior of Belaga, at one tributary of Balui River, one of my favourite destinations after a hectic examination of my law papers. Luyuh had just returned from a visit to Singapore. He was still doubtful with the statement by the NGOs and opposition parties that the construction of Bakun Dam involved the creation of a reservoir the size of Singapore. But that is the fact. The Bakun reservoir has a surface area of 695 sq km. Singapore’s land area was 581 sq km originally, but after its series of land reclamation projects, it presently measures 718 sq km. Luyuh’s children and grandchildren have convinced him of that fact, years later, after the villagers were resettled and their ancestral homeland was inundated. He has since visited Singapore again, but he was still as confused. “Why would they want to flood such a big area? Don’t they know that land is most precious? Don’t they know that many buildings can be built on land, many things can be planted, many people can live on the land? What do you get from a huge lake?” There are Luyuhs everywhere, in the rural communities as well as urban centres. Will they ever get an answer? The passing of Singapore’s founding father Lee Kuan Yew has triggered a lot of writing and discussion on this distinguished statesman. As his country celebrates 50 years of independence, the late Lee Kuan Yew will be remembered for his passion for Singapore, which he led and helped to build, with other founding pioneers, from a little trading port into one of the world’s wealthiest nations. The news of his passing saddens me a little but my thoughts were then brought back in time to those beautiful communities in Ulu Belaga and the time I spent in the homes of Luyuh, Garah and Bawe, the Bakun Dam that ended those trips and the questions of Luyuh, which I am still searching for the answers to. Indeed, the late Lee Kuan Yew and his colleagues had started with a little island country of less than 600 sq km, when they left Malaysia in 1965. Today, 50 years later, that little land mass now thrives as a technology, manufacturing and finance hub, produced a gross domestic product of US$297 billion in 2013 and an impressive GDP per capita of US$55,182.50 placing it in the top 10 best economies in the world. Compared to Malaysia, our GDP was US$313 billion in 2013, and our GDP per capita was only US$10,538 (2013) and we ranked outside 50 in terms of country economy. Anyway, we chose to create a hydro dam reservoir with the same land mass. But, what is the economics of the Bakun Dam project? The Bakun project was originally planned to comprise the second tallest concrete-faced rockfill dam in the world, 730km of overhead transmission lines across half of Sarawak, 670km of undersea transmission cables and 300km of transmission lines in Peninsular Malaysia. It was first approved by the government in 1986 but was shelved in 1990. It was then revived in September 1993 by the federal government, privatising and awarding it to a company in January 1994. The project was to cost US$2.4 billion and was originally scheduled for completion in 2003. The dam was to be built beginning in 1994 by a privatised joint-venture consortium called Bakun Hydroelectric Corporation. The project was again shelved in 1997 and the Malaysian government took back the project from the consortium. By that time, RM4 billion was expended on the “work done” and payout as “compensation” for a member of the consortium. It was revived in 2000 through a 100 per cent government-owned company, Sarawak Hidro Sdn Bhd. The dam construction work was tendered out as a turnkey contract to a Malaysia-China Hydro JV consortium and the completion date has been revised to February 2008. After enduring much more controversies, delays and having been ‘awarded’ the ‘Monuments of corruption’ by Transparency International in its Global Corruption Report 2005, the Bakun Dam came into operation on Aug 6, 2011. The dam had come on line, but without the 300km of overhead high voltage transmission lines and 670km of undersea high voltage transmission cables, a far cry from the original plan. It was announced to have cost RM7.5 billion, but the figure was just not right. With only RM4.5 billion costs incurred by Sarawak Hidro accounted for, easily more than RM10 billion had gone into the project. But, as revealed by Sarawak Hidro, the 2,400MW Bakun hydroelectric dam is currently only operating at slightly more than 50 per cent of its optimum generating capacity of 1,771MW, due to the current needs of SEB, their sole buyer. With the 30-year power purchase agreement signed in 2011, at 6.25 sen per kilowatt hour with an increment of 1.5 per cent each year, and Sarawak Hidro having to pay 1 sen per kilowatt hour to the state as royalty, will Sarawak Hidro recoup its investment at all? For sure, the economic value of the dam is negligible when we compare it with Singapore, making use of the same land mass. Luyuh is right. We don’t have a Lee Kuan Yew, but we don’t need one. The answer, I believe, lies in economics, politics and good governance. It is for the state to undertake a comprehensive cost-benefit analysis on the proposals to implement development projects. A cost-benefit analysis is a systematic process for calculating and comparing benefits and costs of a project, decision or government policy, to satisfy two basic purposes of determining if it is a feasible and sound investment, and to provide a basis for comparing projects, the expected costs and benefits of each option. Sarawak is bestowed with a huge land mass, but we are also blessed with an abundance of resources. We can certainly be as good, if not better than Singapore, if we can improve our governance through better competency and cut wastage and mismanagement. Where are the cost-benefit analyses of building more large dams? Are large dams the only answer to the economic well-being of the state? What are the options to flooding another 400 sq km of land mass for Baram Dam and estimated 500 sq km land mass for Baleh Dam?